Day 18 of WDW-40, the latest of my Disney Trip Reports, is here! Today we spent the day at Epcot. Specifically at the Food & Wine Festival. We didn’t bother with breakfast, lunch or dinner today, decided to just eat our way around the World! 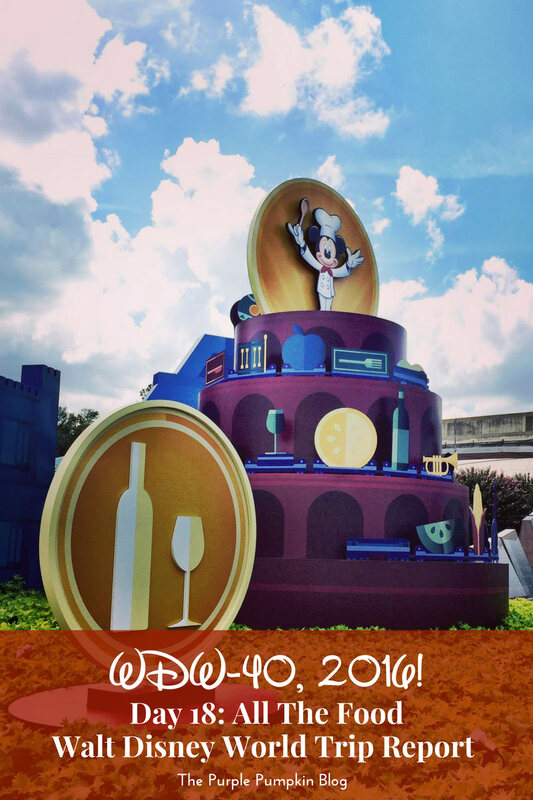 After a couple of down days, I was feeling much better, and we decided to head on over to Epcot for the International Food & Wine Festival 2016. This was our second holiday to Walt Disney World when the festival is on, and I think it’s probably our favourite time of year to go! Since Epcot is on the Monorail loop from the Transportation & Ticket Center, we headed there to catch it, as opposed to driving to the park. Cast Members had done some chalk lettering on the ground which was pretty cool! I stopped to take photos of them, and we made our way up the ramp to wait for the Monorail. The journey from TTC to Epcot is about 15 minutes, but it doesn’t seem that long at all. You get some great views from above the park, as the track actually goes into the park, and encircles it back around Spaceship Earth. Once in the park, we had our photo taken in front of Spaceship Earth (by a Disney Photographer) and made our way directly to Epcot World Showcase. Today is literally all about the food, that, and meeting some characters too! We popped into the Festival Center to take a look at the merch – and no doubt for me to buy some stuff. I love you can buy a cutlery set to carry around with you during the festival! Ultimately, it doesn’t matter if you read my Disney Trip Reports here or on my other blog – it’s all written by me, and the photographs are ones I have taken. Think of it all as one big conglomerate of blog posts from me!